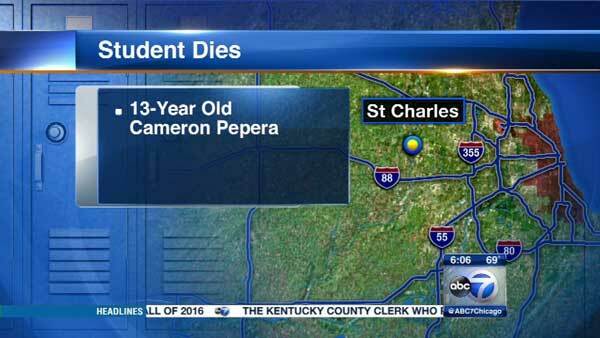 A 13-year-old boy died after he finished a cross country meet in west suburban St. Charles. ST. CHARLES, Ill. -- A 13-year-old boy died after finishing a cross country meet Tuesday evening at a west suburban middle school. Cameron Pepera, a 7th-grader at Thompson Middle School in St. Charles, finished his race at the school when parents said Cameron suffered a seizure, according to Jim Blaney, director of communications for St. Charles School District 303. Paramedics arrived and planned to take Cameron to Delnor Community Hospital in Geneva, but his heart stopped on the ambulance, Blaney said. So paramedics decided to reroute and take Cameron to Central DuPage Hospital in Winfield, Blaney said. Later in the evening, he was transferred to Lurie Children's Hospital, where he died at 8:32 a.m. Wednesday, according to Blaney and the Cook County medical examiner's office. Doctors discovered Cameron had an undetected heart abnormality, Blaney said. An autopsy Thursday did not rule on his cause or manner of death pending further investigation.